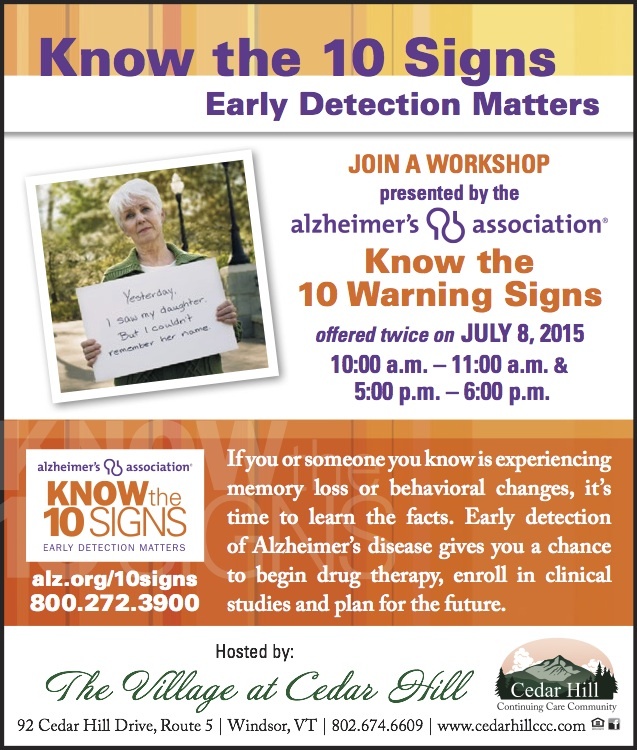 Free Workshop – "KNOW THE 10 SIGNS; EARLY DETECTION MATTERS"
Offered twice – 10 A.M. and 5 P.M. The Alzheimer’s Association “Know the 10 Signs – Early Detection Matters” Workshop provides attendees with an understanding of the difference between age-related memory loss and Alzheimer’s, and what to do if they or someone they know has signs of the disease. Following the presentation there will be a guided discussion led by Alzheimer’s Association Chapter Spokesperson, Maggie Lewis. As many as 5.3 Million Americans are living with Alzheimer’s disease, expected to grow to as many as 16 million by 2050. In 2011 the first wave of baby boomer began turning 65 – which is not only the age of Medicare eligibility, it is also the age of greatest risk for developing Alzheimer’s diseases. Early diagnosis gives individuals the power to make choices about their own health and future with Alzheimer’s in the picture. July 8th and 10 a.m. and again at 5 p.m. Light refreshments will be served. RSVP – Barb Greer 802-674-2254 – Please indicate morning or afternoon workshop.